When you spot the dog doing these activities, interrupt it and take it outside. Avoid picking him up if you can, you want the dog to learn to walk to the back door when it wants relief. *  Have clean up materials handy (plastic bags, pooper scoopers handy. You should aim to clean the waste immediately. *  Remember that your new trainee is a clean animal and doesn't want to soil its own space. *  Remember that one of the first things a newborn puppy learns is to be house-proud. The litter watches their mother cleaning up their waste. This is the reason crate training is so successful. Crates, available from any Pet Supplies store,  may look like a jail to humans, but to a dog it's a den. Dogs like their dens the same way they like going under tables, behind chairs, or under beds. The crate allows you to concentrate on your own activities 24 hours a day. Select a phase that you would be happy saying when standing next to your mother, and use it every time the dog relieves itself. In time, the dog learns to associate that phase with the elimination. Keep it simple "Time to go" or "Pee Time" are simple enough, or you could simply whistle. Be consistent with the tone of the whistle though. At the signs mentioned above take the dog outdoors, and then be prepared to go with the dog and stand outside with it. If you stay inside the dog may be in such a hurry to get back inside he forgets what he went out to do and will perhaps relieve itself inside the house. That's bad training. Wait patiently for five minutes while the Dog sniffs and wanders around the place. DO not play games, be still and silent and then use the word cues you have chosen. Later these words will stimulate him to relieve himself. After the dog has finished, praise him or give a treat – always finish training on a positive note. Accidents happen, and if you catch the dog relieving itself, yell or growl at him. Loud enough to get his attention and then run towards the back door. Your aim is to encourage the dog to willingly follow you outside, where, after the excitement has subsided, it should complete what it has started. Put him in another room while you clean up the mess. This must be stressed: punishment doesn't work; the dog will have no idea what it is being punished for if you dish it out more than 6 seconds after the crime. The dog does understand you are angry, and responds submissively, but its not guilt, the dog just wants to appease you and calm you down. Paper training is good for people living in apartments, but you need to remember that this method prolongs the training. You are training your pup to mess on paper inside the house, the later when he has control of his bladder and bowels, you must retrain him not to mess on paper, but rather mess outdoors. If you are not using a crate (and maybe you should be), the easiest way to paper train is to restrict your pup to one room or one area of a room where the floor has been covered in plastic sheeting, on top of which you lay lots of paper. Your pup will only relieve himself on the newspaper. When removing the dirtied newspaper, save small bits to place in areas where you want your dog to urinate. It takes less than a week for a dog to be trained to eliminate in these areas. Day by day, you reduce the paper-covered areas, until only a few are needed. At the same time, take your dog outside frequently as possible so that he learns to use his outdoor toilet as well. Just as with any other form of house training, only let your pup investigate other parts of your home after he has pooped and peed on his litter box (fine with small dogs), piddle pad, or newspaper. The frequency of his need to empty his bowels and bladder decreases as your pup matures. Remember that the dog's smell is far more acute than ours. 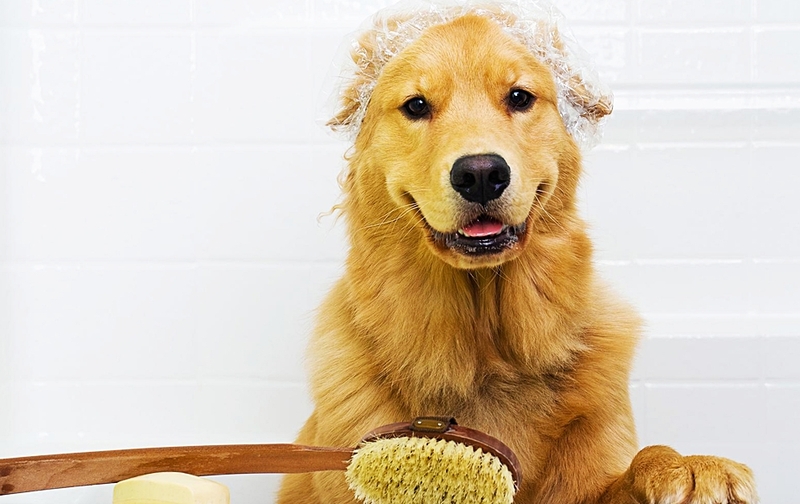 The normal household cleansers may work for us, but they do not mask the odors for the dog. Avoid ammonia based cleansers as ammonia is a natural by-product of wastes and will attract rather than repel. Everything, the carpet, the underlay and even the floor should be treated with an odor-eliminating product.